International Medical Corps is committed to preventing the deaths of millions of children around the world through training local residents to be their own best First Responders. According to the World Health Organization, 6.9 million children did not survive beyond their fifth birthday in 2013. 101 million children around the world are undernourished and 165 million suffer from stunted growth because their bodies do not have enough nutrients. In an effort to help children reach their fifth birthdays, International Medical Corps operates nutrition and food security programs in some of the world’s most food-stressed areas, including Afghanistan, Syria, Ethiopia, Somalia, Nigeria, Mali, Chad and South Sudan. Prevention measures protect children from the devastating long-term effects of malnutrition. Without proper nutrition, which includes all the necessary micronutrients, a child’s physical and mental development is stunted. This in turn impacts his or her potential to become a fully functioning member of society. Emaria, a four-year-old boy in Ethiopia, was abandoned by his mother when he was only nine months old and is now being raised by his grandmother. The grandmother fed Emaria goat’s milk because it was all she could afford, but this was not enough nourishment for the small, vulnerable child. She said Emaria was often irritated by small things and cried often, so she brought him to a local clinic where International Medical Corps trained staff work. 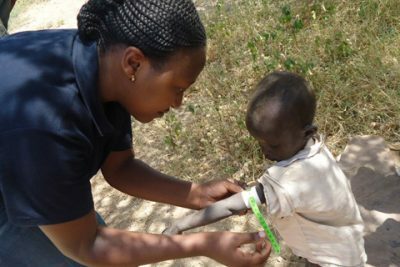 An International Medical Corps trained community health worker diagnosed Emaria with severe acute malnutrition during a medical screening. The health worker referred Emaria to a special nutrition program at a local health facility to help him recover from malnutrition. Emaria’s grandmother started to take him to the local health facility every week for a check-up and to receive Plumpy’nut, a peanut-based paste that can be eaten at home and prevents most children from being admitted to the hospital. Plumpy’nut has a shelf life of two years and requires no water, preparation or refrigeration and is an ideal solution for children like Emaria. This is the best possible treatment Emaria can receive for his condition. By the end of only six weeks and six visits, Emaria had shown a remarkable improvement. He graduated from the life-saving severe acute malnutrition program to a program that helped provide him with a balanced, nutritious supplement and taught his grandmother about critical infant and young child-feeding practices. Emaria was then discharged as cured because he had attained his targets! Emaria’s grandmother, after witnessing her grandson’s miraculous recovery through such simple methods, has now become an advocate in her community against malnutrition. “I am very happy with the work that the community health workers are doing. They saved my grandson’s life because after taking the food ration his health improved tremendously” she said with a smile. The grandmother reports that Emaria is a more active, playful and happy child, he in so longer easily irritated or cries easily. Through this experience, not only did Emaria’s health improve, but his grandmother became her own best First Responder. She urges her neighbors to feed their children properly because she does not want to see anyone else’s children suffer and she ensures her other grandchildren’s health and nutrition. Now, Emaria will celebrate his fifth birthday as a happy, healthy child, as every child should!